What’s his title? 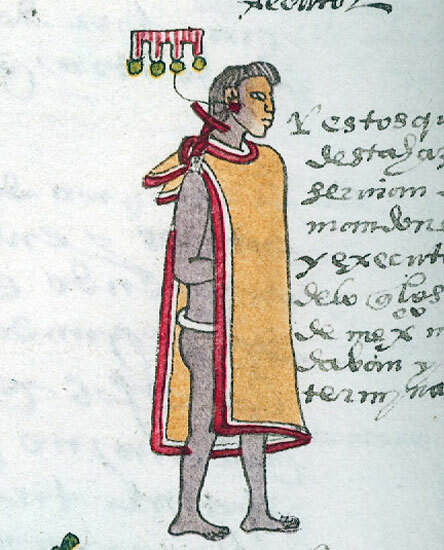 He’s been called ‘Raining Blood’, ‘Blood Rain’, ‘Dried Blood’, ‘Shedder of Blood’... (in Náhuatl Ezhuahuácatl). 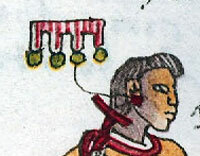 Clearly his name glyph shows four drops of red-striped liquid - a vivid depiction of bloodshed! As to whether he was a commoner or a noble, there’s some doubt about this. 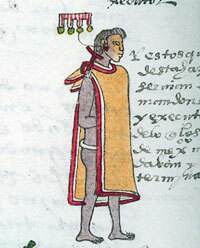 Sahagún (who compiled the Florentine Codex) states in one place that all Constables were commoners, but elsewhere he refers to Ezhuahuácatl titles as those of nobles. 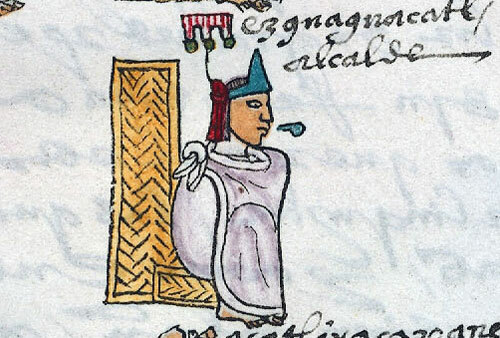 And here (right) he’s shown (a few pages further on in the Codex Mendoza) clearly as a noble appeals court judge, sitting on a reed seat with backrest and wearing a turquoise diadem. Commoner or noble? Perhaps we’ll never know. But obviously his work revolved around judging crime and meting out punishment. Now why only 3 drops of blood when he’s working as a judge...?! 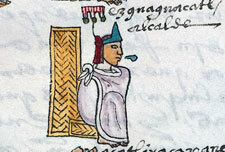 This is a picture from the Codex Mendoza of the noble, judge, and general Ezhuahuacatl. His name does mean raining blood.